NASCAR is a sport founded on skill and performance, so it is natural that we place a premium on developing talent. The people who work here are our winning competitive difference, and an important part of our success lies in the experience, leadership and training that NASCAR provides. At NASCAR, development comes in many forms, from challenging job assignments, to team projects, to formal skills and leadership training, to a culture of informal mentoring and coaching. At NASCAR, we believe in hiring the best and growing them for success. 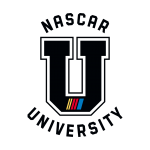 To efficiently distribute training across its geographically dispersed employee base, NASCAR created NASCAR University as a way to actualize our belief that people are the wining competitive difference – both on and off the track. The custom educational platform housed on the company’s web portal boasts a blend of live and online learning, focused on enriching a broad skill set. NASCAR University aligns with our values of growth, contribution, competition and expertise. So whether you are an accountant, marketer, lawyer or engineer, NASCAR is a great place to develop your skills. Training for positions at the race track can be challenging but NASCAR has figured that out! A blend of live and on-line courses make up the requirements for all new NASCAR officials and regular and ongoing training is a must for these specialised jobs. For four years now, NASCAR has been recognized as a top learning organization by Elearning.